Identity and user lifecycle management projects are being deployed more and more frequently - and demand is growing. 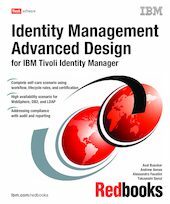 By demonstrating how IBM Tivoli Identity Manager can be made resilient and adapted to special functional requirements, this IBM Redbooks publication creates or enhances confidence in the IBM Tivoli Identity Manager-based solution for senior management, architects, and security administrators. Advanced design topics can start with infrastructure availability for all involved components, Web application, and database server clustering as well as LDAP multi-master setups, continuing with compliance challenges addressing enhanced auditing and reporting, and designing and creating your own self-care/self-registration application environment that embraces external users and business partners offering fine-tuned workflow options and lifecycle management capabilities. The powerful features and extensions of IBM Tivoli Identity Manager are opening doors into a world of advanced design and customization for every identity management challenge you might encounter. Chapter 3. Tivoli Austin Airlines, Inc.